I am satisfied with my efforts for this year. There are so many directions one could turn for new things to sew for next year. I want to use up more of my scraps. Kind of like making something for nothing. I want to finish some of my outstanding UFO's and I want to make a few more doll quilts than I did this year as we could have used more at Toy Drive time this month. I am getting my kits organized for my turn at Scrap Bag Quilters in January. We will be using home made Layer Cakes and I have done the math so that the project could be made with nickles or other size squares. My finished sample was done with nickles. 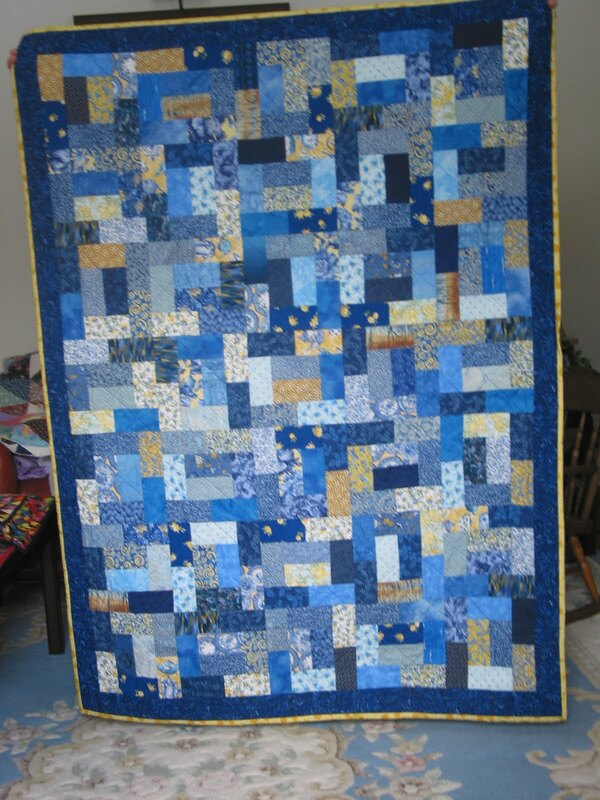 Makes a nice baby size quilt. I will reveal all after the day has happened. We are having an extra Community Outreach day in Janaury and I volunteered to get that ready. More after than event too. Don't want to ruin the surprise for participants. 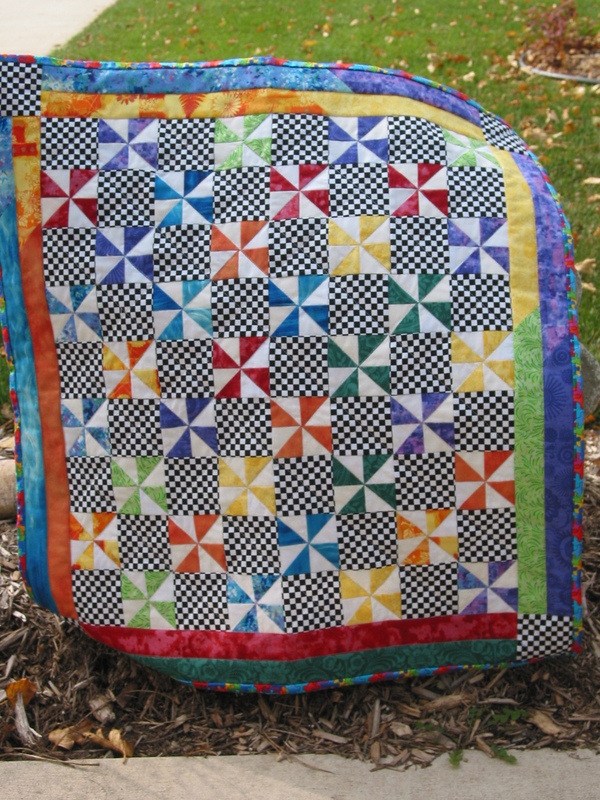 This quilt is on its way to a new owner. The daughter of friends of ours is in hospital waiting a transplant. She is always cold. I hope the bright cheery colours will help warm her up while she waits. 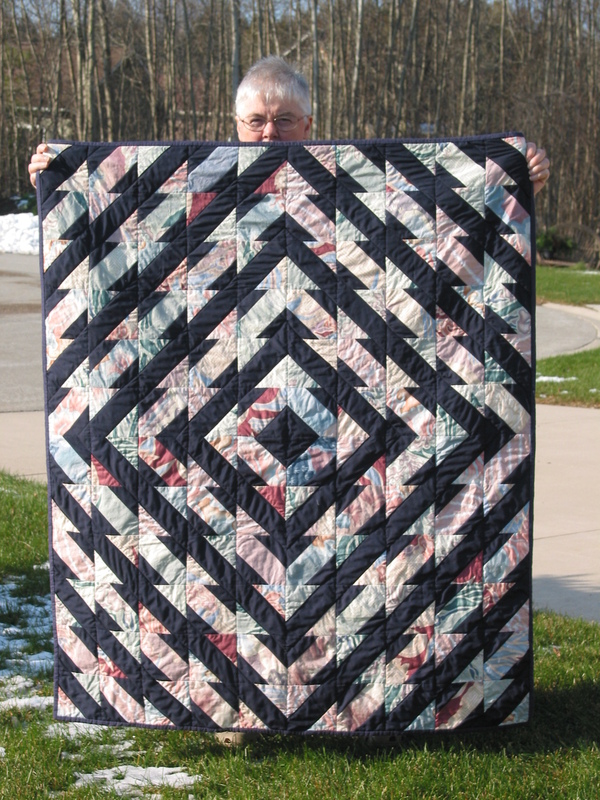 This little baby quilt was made from "waste" triangles and from fabric samples that consisted of black and white squares. All the sample pieces were individually cut to make certain they were all the same. 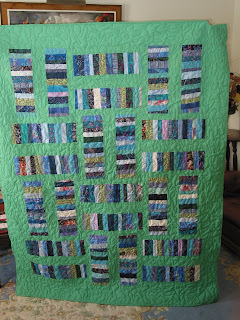 The borders were the strips left after the original pieces were cut. 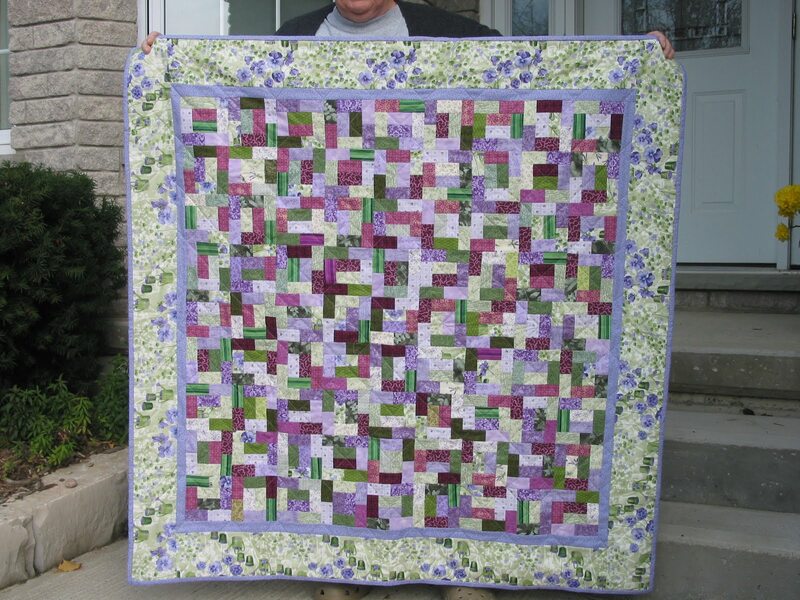 I donated the quilt to Project Linus with the Kincardine Sunset quilters guild. This little duffle bag was made for my grandson. There is a blue one for my other grandson. During my first visit to Charlottesville, Xavier found some bee fabric at the local quilt shop. He thought I should buy some and make something for him with the fabric. Hence the duffle bag. They are apparently just the right size for a sleep over. 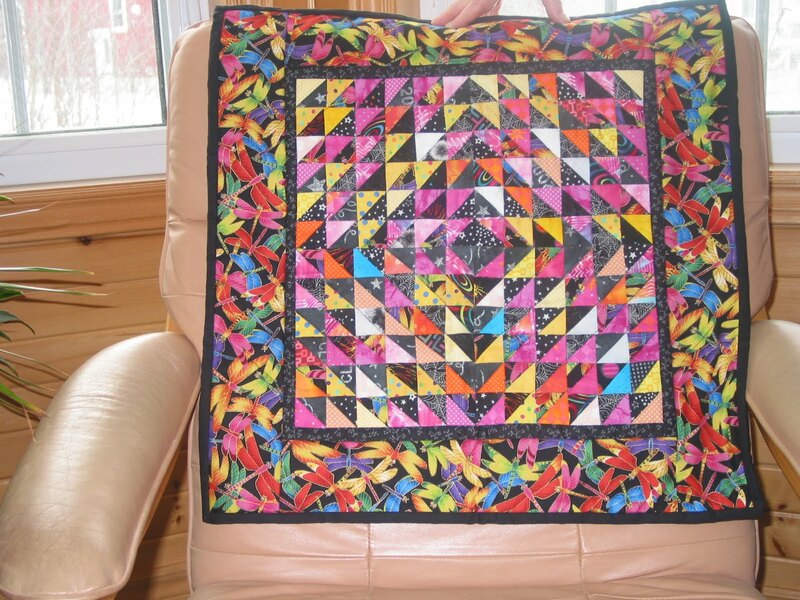 My quilting "mojo" was lost in the shuffle of cleaning out my sewing room. I can say that my sewing room has been cleaned and everything has been sorted. The room is ready to be used. 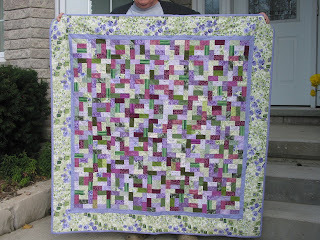 At the last Kincardine Sunset Quilt Guild meeting one of the members approached me at the break. 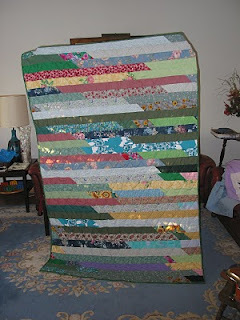 She told me how her niece had been given one of the quilts I donated to Project Linus last spring. 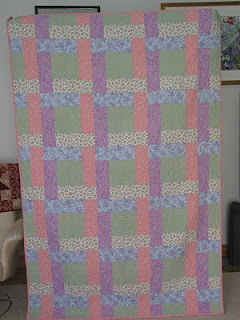 The aunt, a member of the guild, recognized it from show and tell at the quilt guild meeting. She had taken a picture of her niece with the quilt and told me how much the quilt meant to the niece. I was mighty close to tears. 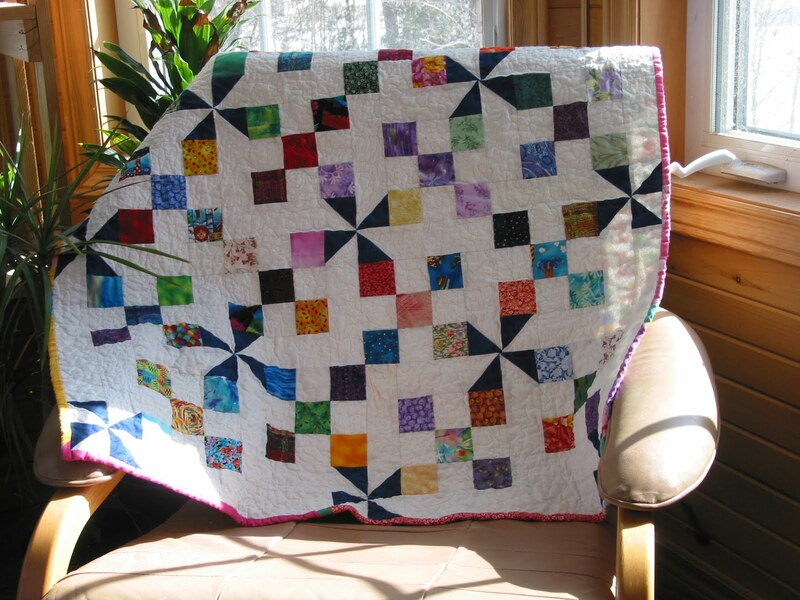 So often we make quilts and give them away hoping they will end up in a good home where someone cares for them. This time I got the proof in a picture and the story from the aunt. What happened to the summer of 2011? I can hardly believe it is September. We had a very chopped up summer with very little actually being accomplished. A wee little mouse problem has lead to the total clear out of my sewing room. No little guys in evidence but the thought still lingers. The total clean out did however make me realize what a pile of UFO's I have amassed and how much stash I have accumulated. I would say what was I thinking but there might be some doubt that I was in fact thinking. All I have actuully finished this summer are three duffle bags. One is for myself and the other two are for the boys. The older grandson said bees and so bees it was. 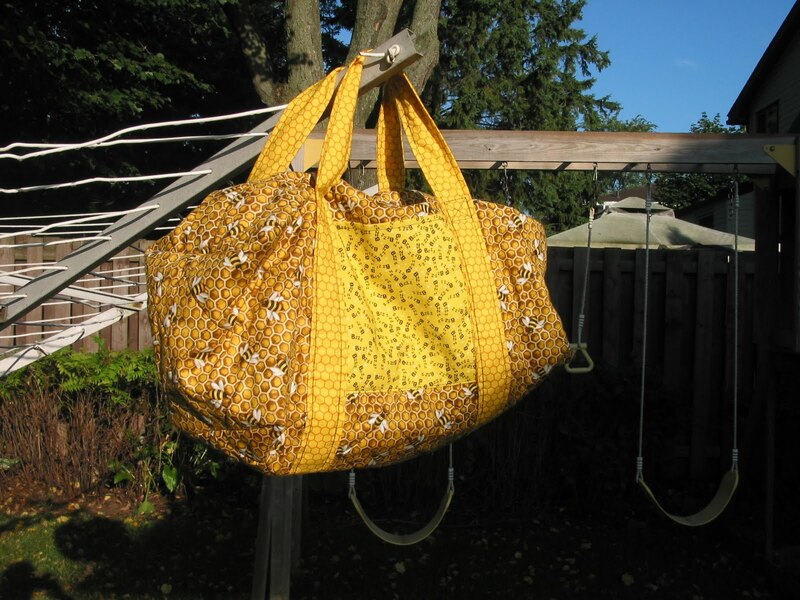 I found five different fabrics with bees on them and used them. Hopefully a picture can be taken soon and I can post it. Much as I tried to avoid being in the picture a part of me is there. 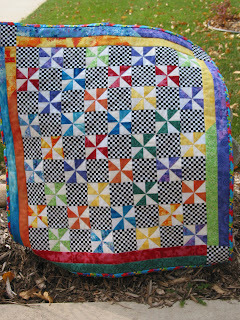 This is the Quilt As You Go Table Runner project from one of the classes I took at Quilt Canada in May. It is much brighter and bolder than I normally go. There was technique to this table runner and I think I could do better on a second one. I do however like this one. My trip to Virginia last weekend was good. It was very HOT there. I did manage to get to a quilt shop and I did manage to help out the local economy.The lady at the front desk of the hotel told me about another shop but a visit to that shop will have to wait until my next trip south. Yet another scrappy one. This one has gone in the mail to my nephew for a wedding gift. 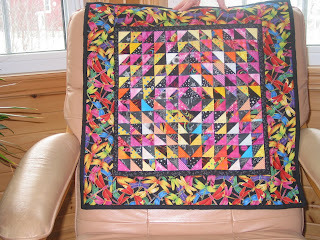 The pattern is called Angles and Squares and was taught in a workshop at the Kincardine Guild by Heather Stewart. I was very pleased with the result. 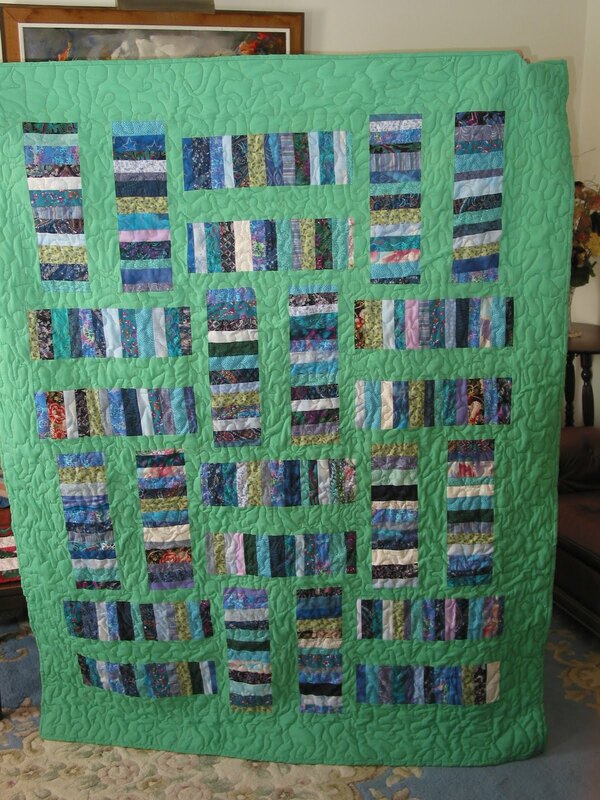 This quilt is Woven Ribbons from Quilters Cache. 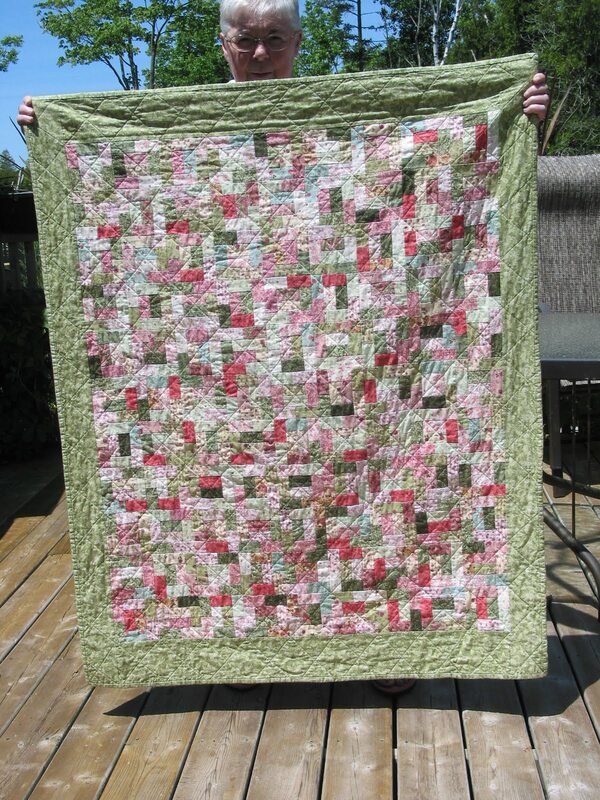 I am donating it to the Kincardine Sunset Guild for their outreach project this year. It was very easy to put together. I virtually never work with pastels so that was different for me. 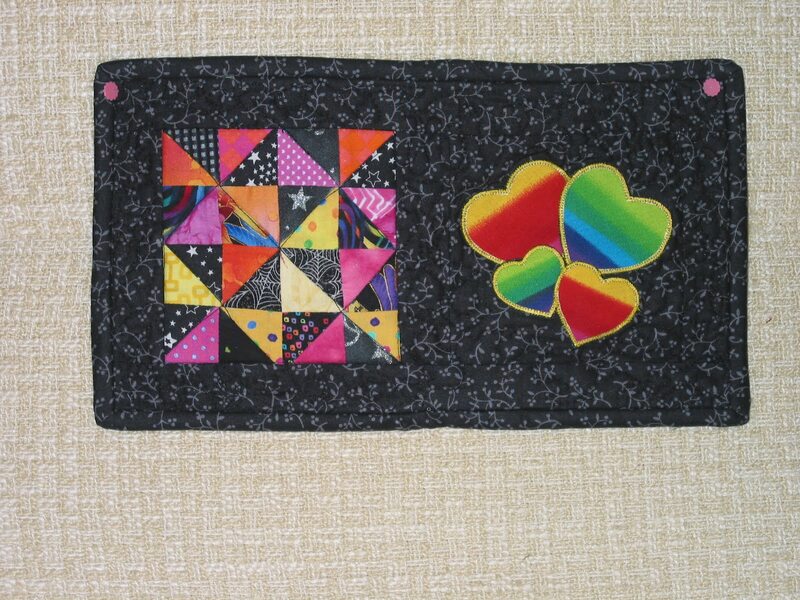 I have finished a baby quilt and two doll quilts for the next Scrap Bag meeting. I feel as though I am back at it. That being said my workhorse Bernina needs repair and it will be almost two weeks before we can get it to the machine repair person and then he will have it for a couple of weeks at least. The foot pedal is not connecting. We tried to take it apart ourselves and were not successful, so we figured a professional repair was in order. 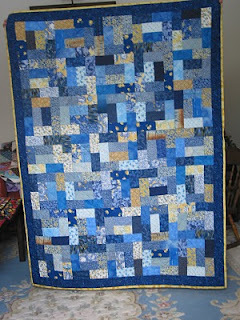 This little quilt is called Steppin' to the Nine's . The directions were provided on-line at one of my Yahoo groups. 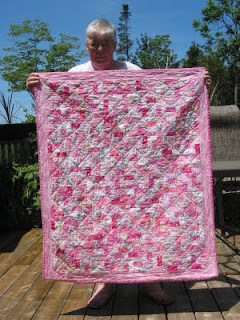 I am donating it to the Kincardine Sunset Quilt Guild's Project Linus drive for this year. Yesterday was the day I handed it in. 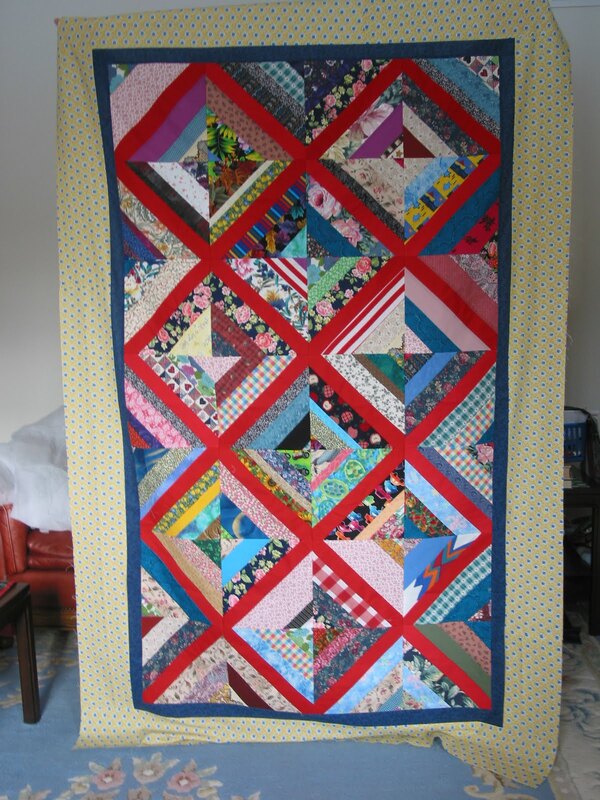 Several others have made lovely baby quilts and some for older children too. 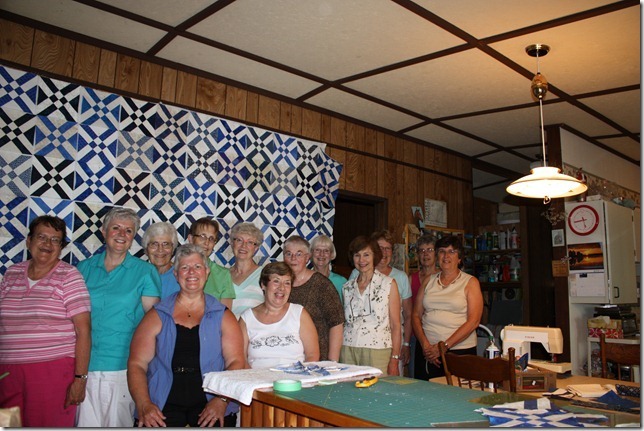 The Kincardine Sunset Quilt guild is a very friendly group and I enjoy their hands on approach to quilting. Our drive to Kincardine was fine but the return trip featured ice pellets, snow and rain. That is the nasty part of living in this part of the world. 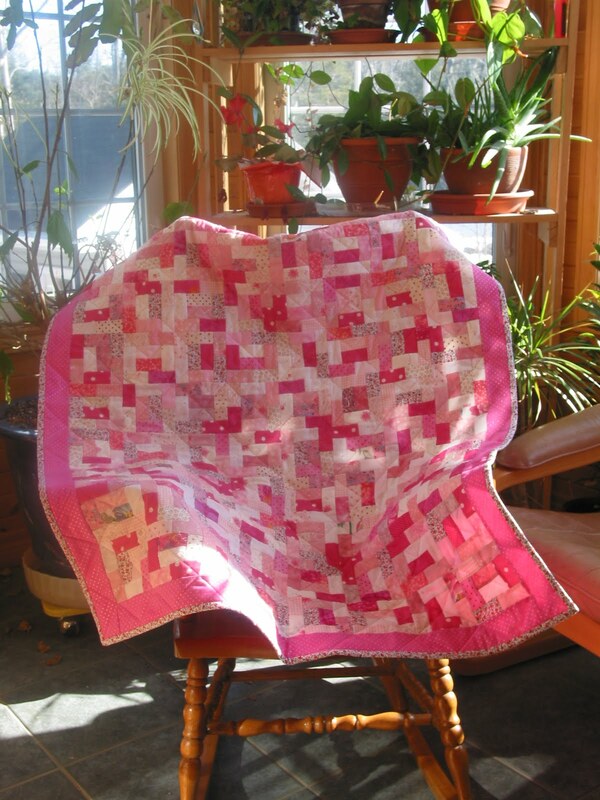 Two of the quilters have made quilts following directions I gave verbally in January. That was a real boost. Tomorrow is Family Day in Ontario. It is a mid-winter holiday where families are encouraged to spend time together. Our family lives about two hours away from us so today while the weather looked OK we made a run for it. I delivered the blue and yellow quilt to my sister and the little hot mat pictured to the left. The plates set on the placemats give you some sense of scale. 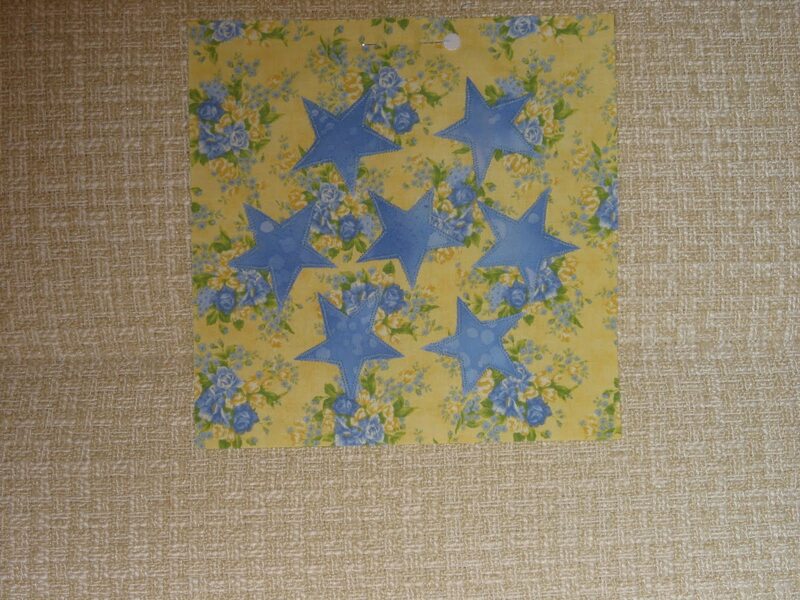 I still have more of these tiny HST to make into something. We got our hug bank replenished by the grandsons. And had a lovely birthday lunch to celebrate all the February birthdays. Grandson number 2, his Dad, his other Grandma and my Husband all have February birthdays. It meant the other three at the table had to sing Happy Birthday extra loud. The first part of this month very little was accomplished in the sewing room. We babysat the grandson's for a week and then needed another week to "recover" and catch up on what had not been done the previous week. This quilt is the same quilt design that I made for my sister (the blue and yellow quilt) but for this one I used the last of some pink scraps and cut the bricks 1 1/2" by 2 1/2". The setting is 8 blocks by 11 blocks. 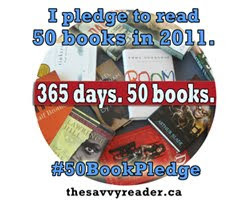 I will be donating it to my Scrap Bag group. I took another quilt to a baby shower yesterday and was a little overwhelmed when the new Mom started to cry when she saw it. 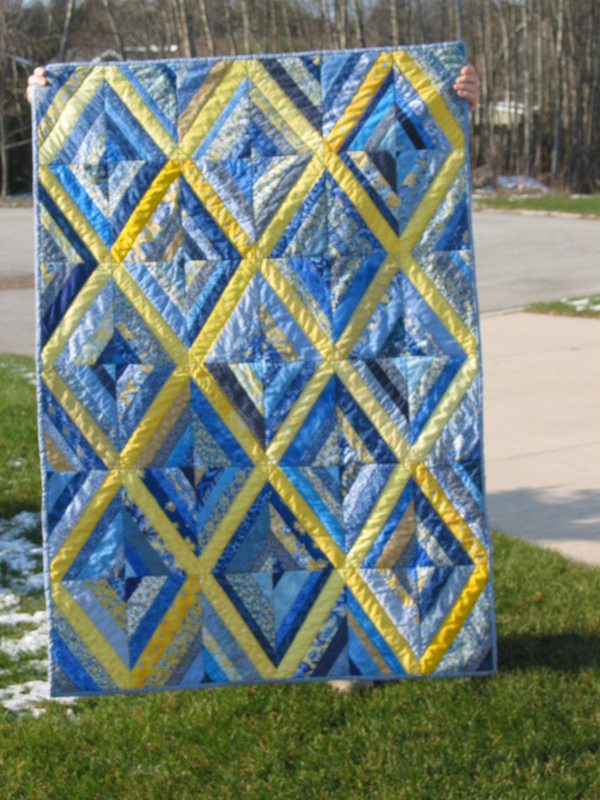 She did not have any quilts for her very sweet little guy. The quilt was a Mystery one that I made very scrappy and it turned out to the the Jewel Box pattern. 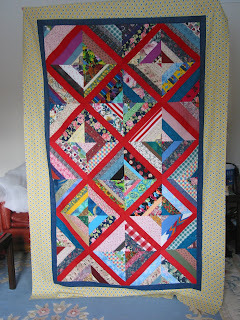 Nothing quilty has been finished around here for over a week. Several projects are moving along towards completion. Last week we had our grandsons here. The boys are almost 3 and 4 1/2. So they had our undivided attention for the time they were here. Our daughter and her family are relocating to Virginia once they sell their house. Our son-in-law has now "moved" to Virginia. He was to start work today. My Scrap Bag group last week went well. All 10 kits were either worked on or taken home for a friend to complete. 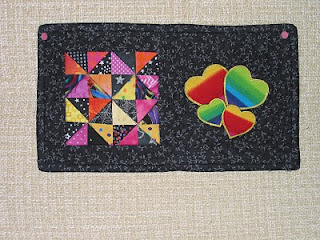 Hopefully they will come back in February as tops or better yet as quilts. 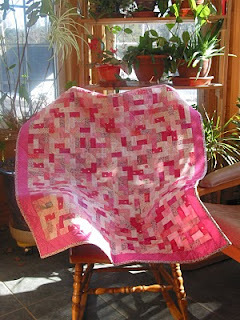 I am working on a baby quilt in pinks using the same block pattern but with the tiny bricks. 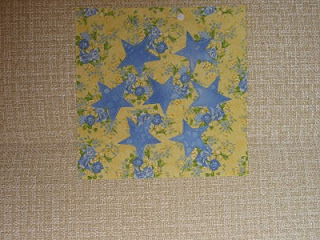 Looks like 80 blocks will make a nice size baby quilt.